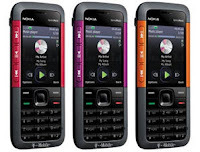 I recently unlocked my Nokia 5310 XpressMusic phone that I am using with T-Mobile and thought I would post some instructions for the unlock process. If you have been on a contract with T-Mobile for a certain amount of time (at least 3 months I think but it could vary based on phone), you can call T-Mobile and get an unlock code emailed to you within 1 to 7 days. It took less than a day for me. NOTE: If you receive an error message while performing the instructions below, stop. Please be aware that if an excessive amount of incorrect attempts are made, the phone will be permanently locked. 7. Press 1, then # and the display should read "SIM Restriction Off"
Pay special attention to the note above about your phone getting permanently locked if too many incorrect attempts are made to unlock the phone. Nice sharing.I would like to share my personal experience about unlocking the phone.I got unlock code for my phone from the site Prounlocking.com .Here they asked me to provide country name and service provider of my phone.Then they provided me unlock code. This is reliable and secure.